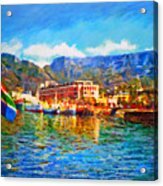 Sa Flag At The Waterfront by Michael Durst - 8.000" x 5.875"
Sa Flag At The Waterfront art print by Michael Durst. Our prints are produced on acid-free papers using archival inks to guarantee that they last a lifetime without fading or loss of color. All art prints include a 1" white border around the image to allow for future framing and matting, if desired. Beautiful! Your area must be spectacular. Love the blues here. 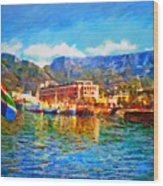 Congratulations Michael for your sale of your beautiful Sa Flag At The Waterfront!!! Thanks, Kimberlee, for your wonderful comment on this painting. 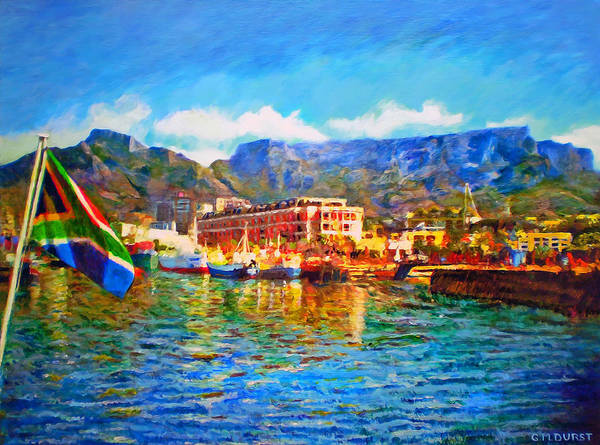 The scene from the Waterfront here in Cape Town is always spectacular! Michael, I just voted for this beauty in a contest! This is a gorgeous water scene with the reflection of the boats on the water and the light from the sun! Love the main colors--blues of all tones and golds! A brilliant painting for sure! This painting deserves top placement for sure! Best of luck to you! what a wonderful tropical color! 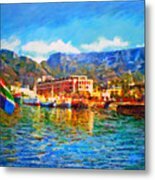 Thank you, Debara and Dave, for your wonderful comments on this painting and for your kind support! Thank you so much, Anne-Elizabeth for your positive comment on this work and my other art as well. I really appreciate you taking the time to do so! Michael, This is one of many of your works of art that delight me. You are so very talented. I like all the details in this painting, the beautiful colors and the reflections in the water. Good wishes to you. Thank you, Sharon, I am always so honored by your comments! Beautiful image and flow! Congrats on your sale! 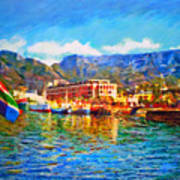 The scene is of the Waterfront in Cape Town, South Africa. The South African flag waves over the Table Bay, with Table Mountain in the background. What a patriotic scene and one that is so beautifully Cape Town!